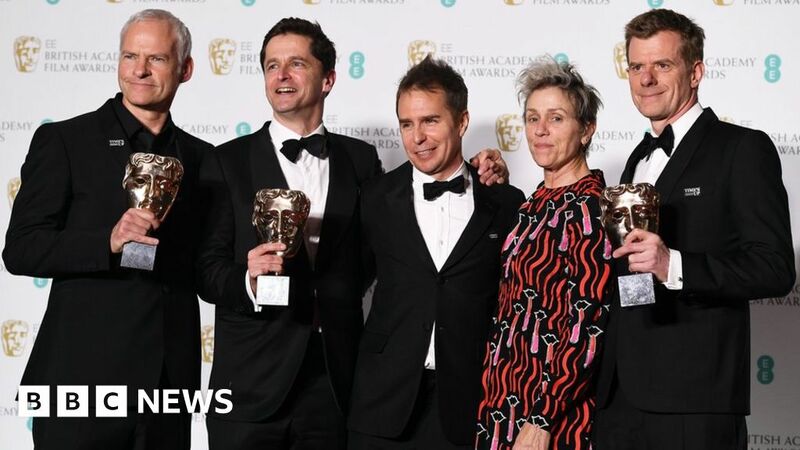 Three Billboards Outside Ebbing, Missouri, about a woman seeking justice for her daughter’s murder, scooped the top prizes at the Bafta Film Awards. Gary Oldman won best actor for playing Winston Churchill – one of two awards for World War Two epic Darkest Hour. But there were few surprises among the main awards on a night when the main talking point came from the fact most guests wore black in support of the Time’s Up and Me Too campaigns. Three Billboards, set in the wake of a gruesome killing in Missouri, was written and directed by British-born Martin McDonagh. The Bafta (British Academy Film Awards) results will strengthen its chances at the Oscars in two weeks – although Bafta’s last three best films have not gone on to win best picture at the Oscars. As well as best film, best British film and best actress, its haul included best supporting actor for Sam Rockwell and best original screenplay for McDonagh. The Shape of Water led the Bafta nominations with 12, but came away with three – best director, production design and original music. Joanna Lumley hosted for the first time after taking over from Stephen Fry.